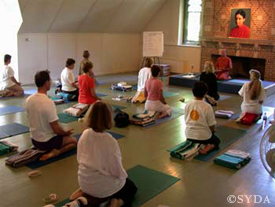 For over a quarter of a century, the Siddha Yoga Ashram in Boston has been imbued with the powerful energy of spiritual practice, and the profound wisdom of the Siddha Yoga Gurus. The ashram was where, in 1980, Baba Muktananda began writing his book Secret of the Siddhas— a text that speaks of the state of the Siddhas and explains the basic tenets of Kashmir Shaivism. 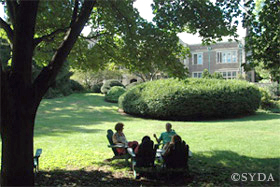 Over the years, the Ashram has been a seat of residence for both Baba Muktananda and Gurumayi Chidvilasananda. Just as the Ashram holds great value in the context of Siddha Yoga history, the building, appropriately, holds its own prestigious history. The interior and exterior structure, built in 1910, is considered by historians to be a beautiful and significant example of early 20th century workmanship in the Jacobean style. 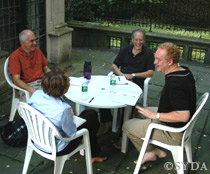 The Siddha Yoga Ashram in Boston now provides the venue for an optimal learning and teaching environment where Siddha Yogis can participate in the practices and engage in study and discussion groups while on retreat.